Hi, my name is Geneda and I am a second year elementary school teacher. I graduated in 2014 with my Master's in Teaching. I am currently teaching third grade. I absolutely love children and I love learning and helping them learn. I am more of a hands on learner and that is also my teaching style. I love playing games, singing songs, and making up dance moves to help recall information. I have been working with children since the age of 16. I have volunteered with organizations, I have tutored, nannied, and mentored. What I love about tutoring that there is not structure. We get to meet up on a mutual time, at a mutual place, and just relax and learn. I love the one to one ratio that tutoring offers a lot of times. It really focuses in on the individuals needs and pinpoints where they may struggle and need extra assistance. I taught reading last year in first grade. I also tutored for reading. I am pre-k-6th grade certified to teach. I am very familiar and well rounded in all subjects and across the grade levels. Geneda hasn’t set a schedule. I am qualified to tutor elementary (preK-6th) because I am a licensed teacher for the state of Virginia. I have passed all of the required testing to become a teacher. 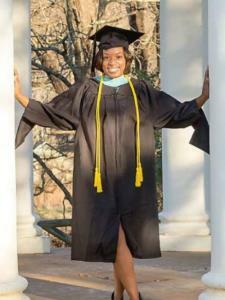 I have a Master's degree in teaching and am going back for a Master's in Education. I am also in my second year of teaching.